After my post on Instagram I want to share this with you. Even for me being that of a mixed raced woman, I'm quite fair. It's something that's constantly pointed out to me relentlessly (yes, I get it, I'm frigging pale)but that's the great thing about tans, there's so many on the market and one brand that was introduced to me a couple of months ago is Cocoa Brown. 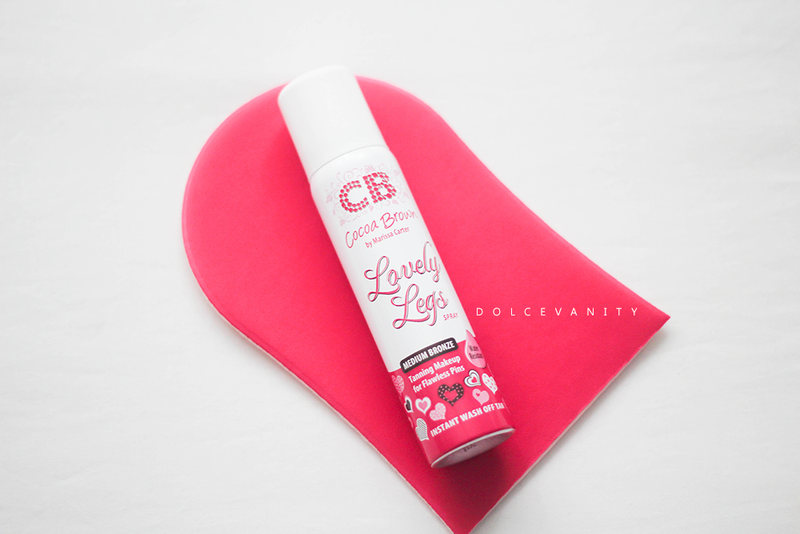 I was sent their Lovely Legs spray, currently only in Medium Bronze. No secret I love a good glow, so why not spread and share it onto the legs. Pretty simple. Exfoliate the legs, they offer a scrub within the range too. On clean and dry legs (free of creams and oils) just spray it onto your mitt and buff it onto your legs (as you can see above)! I experienced no streaking or patchy application. There's one thing I'd like to note - the scent. Surprisingly it doesn't have that fake tan smell. It's a very pleasant and familiar scent, bugging me what it is but whatever it is - don't change it! The colour looks as if it's going to be a bad choice at first like when sprayed onto the mitt, a clay, muddy orange undertone brown but fear not...once onto the legs and buffed in it settles to a more realistic brown tone. It's meant to hide imperfections, I have some scars around / on my knees but it doesn't say scarring but things such as veins, uneven skintone, it washes off easily and quickly, no fuss and no left over streaking . I'm quite happy with my results and for the price £7.99, how can you go wrong?